A shower doors that leaks, as shown in Figure 1, is a common problem in a home. Leaky shower doors can lead to a host of other problems such as damage to flooring, drywall, moldings, trims and possibly even sub-floors. 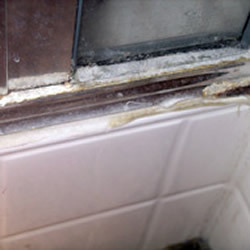 As well, shower door leaks can be a cause of mold and mildew problems within the bathroom. There may be no need to replace the shower door, as a shower door that leaks may be able to be repaired relatively easily and inexpensively by most home handymen. The leaking water can be a result of direct water seeping out or from condensation. It really doesn’t matter which situation you have. The metal framework around the door that is attached to the walls of the shower enclosure. In many cases the homeowner does not see water pouring out of the shower, but instead sees the results of water leaking out for months or even years in damage and/or mold and mildew stains on walls, baseboards and flooring. Most leaks, which show themselves in water damage to the area just outside the shower door itself, are the direct result of an improper initial installation of the shower door. A shower doors and its associated framework is made with drainage holes or channels that are designed to allow any water that enters the track or frame to drain to the inside of the door and eventually find its way to the shower drain. What commonly happens is that inexperienced shower door installers add a bead of caulking on the inside of the door framework, believing that sealing the framework will prevent any water form exiting the shower door structure. It would seem to make common sense that caulking the shower door framing everywhere there is a joint will prevent water leakage. What actually happens is the exact opposite, because the inside drainage channels or holes are blocked with the caulking the water eventually finds an exit on the outside of the shower door. To make matters worse, the homeowner, when faced with the leaky shower door, proceeds to add additional caulking over the old caulking, on the inside of the shower door frame in an attempt to stop the leaking. This additional caulking only serves to compound the original installation error and only makes the problem worse. Note: It is also possible for the drainage channels and weep holes to become clogged with soap scum or other dirt and grime. If you are sure that you do not have caulking on the inside of the shower door frame and are experience leaks, inspect the drainage holes and if necessary clear them of any clogs. Note: Before starting the shower door repair it is wise to place some masking or duct tape over the drain so that pieces of caulking that have been removed do not end up clogging the shower drain. Using a razor blade style scraper, remove any and all caulking that is on the inside of the shower door frame. Inspect the drainage holes and channels and ensure that they are not clogged with caulk, soap residue or other grime. This can be done with a needle, finishing nail, or a thin skewer that is used for trussing fowl. Inspect the rubber seals around glass and framework, ensuring that they have not been damaged. Some shower doors have a vinyl or rubber strip along the bottom of the door. These door sweeps do wear and can be the cause of water leaking out of the shower. If your door sweep is warn you should replace it. Caulk the outside of the shower door frame using 100% silicon caulking. If there is caulking currently on the outside of the shower door frame, remove it. Placing new caulking over old can create voids and sealing problems. Note: 100% silicon caulking is the best product for sealing around shower doors because it doesn’t shrink or crack and remains flexible for extended periods. Silicon is also mold and mildew resistant. Acrylic caulking on the other hand does have a tendency to shrink, crack and harden. Note: There are known instances where the shower door frame was installed backwards, primarily because the homeowner wanted the shower door to operate in the opposite direction. This places the drainage holes or channels on the outside of the frame, rather than the inside. If you should identify this as the problem, the frame must be removed and installed correctly. Many shower doors do not have a left/right opening interchangeability and it may be necessary to replace the shower door with one that opens in the direction you desire. Any damage done by the leaking shower door to sub-floors, molding, trim or drywall should be repaired.